A delegation of U.S. Democratic and Republican Party leaders and U.S. business leaders met with Communist Party of China (CPC) senior officials and Chinese business leaders in Beijing, China, for the 8th U.S.-China High-Level Political Party Leaders Dialogue, organized by the EastWest Institute (EWI) in partnership with the International Department of the Central Committee of the Communist Party of China (IDCPC), on May 6-8, 2015. Ronald Kirk, former United States trade representative and former mayor of Dallas, and R. James Nicholson, former chairman of the Republican National Committee and former secretary of the Department of Veterans Affairs, respectively led the U.S. Democratic and Republican delegations. The Chinese delegation was led by Wang Jiarui, vice chairman of the National Committee of the Chinese People’s Political Consultative Conference (CPPCC) and the minister of the International Department of the Central Committee of the Communist Party of China (IDCPC). EWI Director John Hurley and David Firestein, EWI’s Perot fellow and vice president for the Strategic Trust-Building Initiative and Track 2 Diplomacy, also participated as non-partisan delegates. 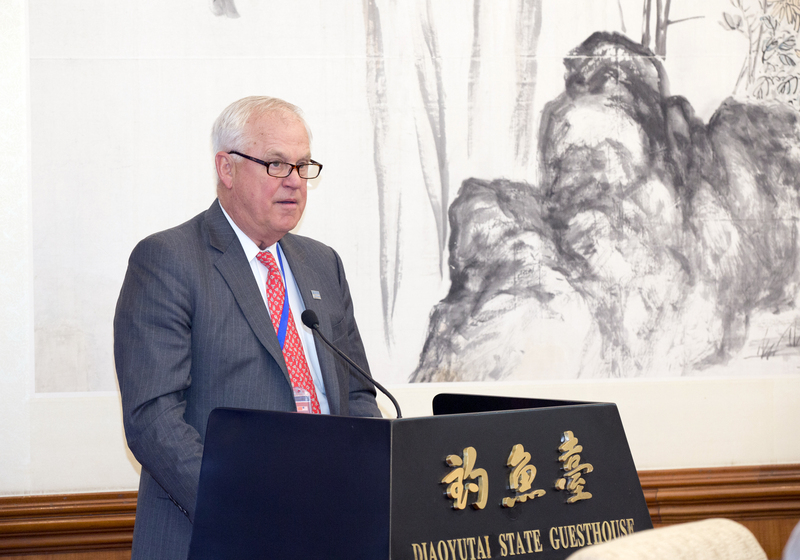 In addition to the plenary dialogue session, EWI and the IDCPC co-hosted an inaugural U.S.-China Entrepreneurs Roundtable with the China Economic Cooperation Center, which included the participation of U.S. and Chinese corporate representatives. The U.S. delegation also met with Politburo Standing Committee member Wang Qishan, who leads China’s ongoing anti-corruption campaign as secretary of the Central Commission for Discipline Inspection, and Executive Vice Minister of Foreign Affairs Zhang Yesui. The U.S.-China High-Level Political Party Leaders Dialogue, launched in 2010, seeks to build understanding and trust between political elites from the United States and China through an exchange of views on governance and foreign policy issues. It is currently the only U.S.-China dialogue process involving sitting officers from the CPC and the U.S. Democratic and Republican National Committees. Click here to download event report. 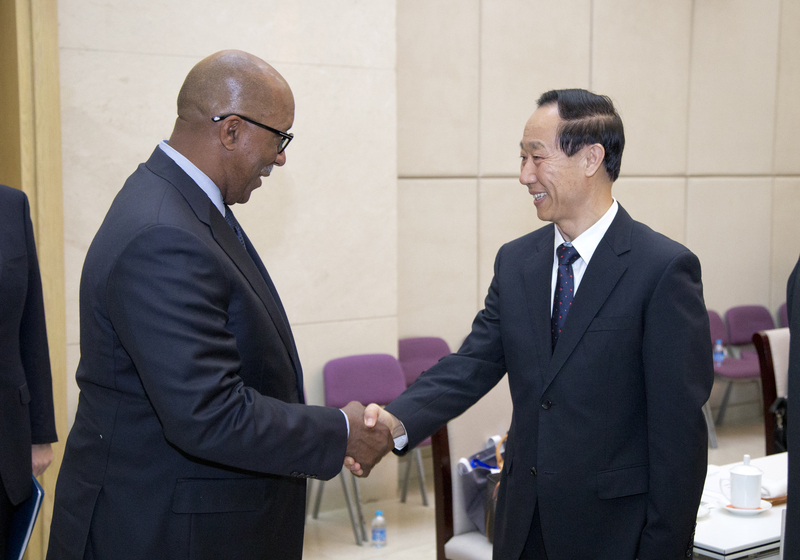 Vice Chairman Wang Jiarui greets Ambassador Ronald Kirk. 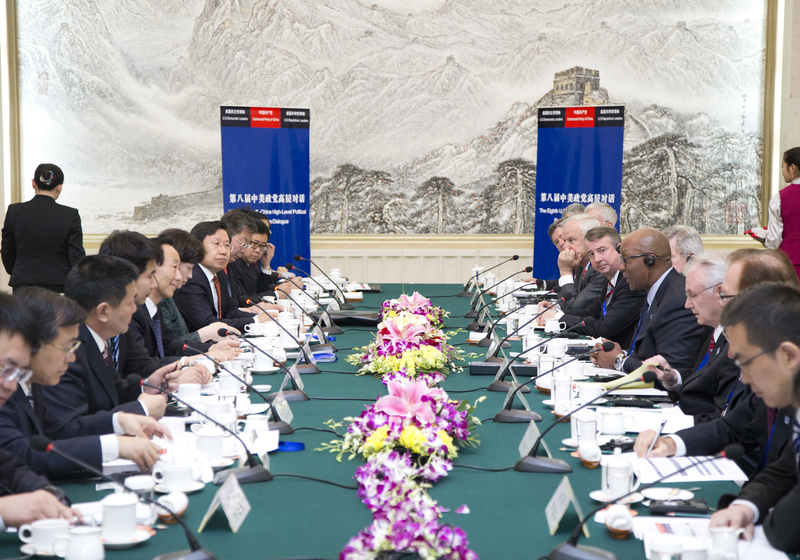 8th U.S.-China High-Level Political Party Leaders Dialogue. 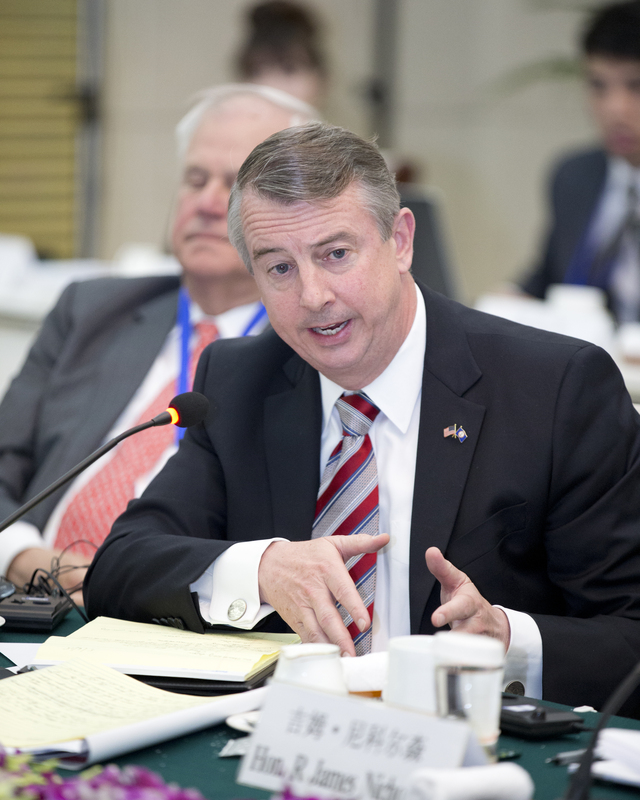 Former Republican National Committee Chairman Edward Gillespie speaks at the 8th U.S.-China High-Level Political Party Leaders Dialogue. 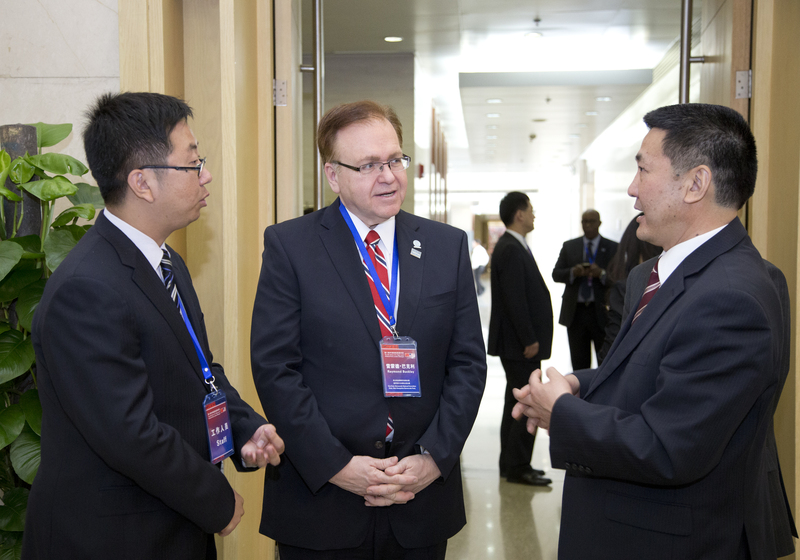 Democratic National Committee Vice Chair and New Hampshire Democratic Party Chair Raymond Buckley speaks to Fu Kui of the CPC’s Central Commission for Discipline Inspection (far right). 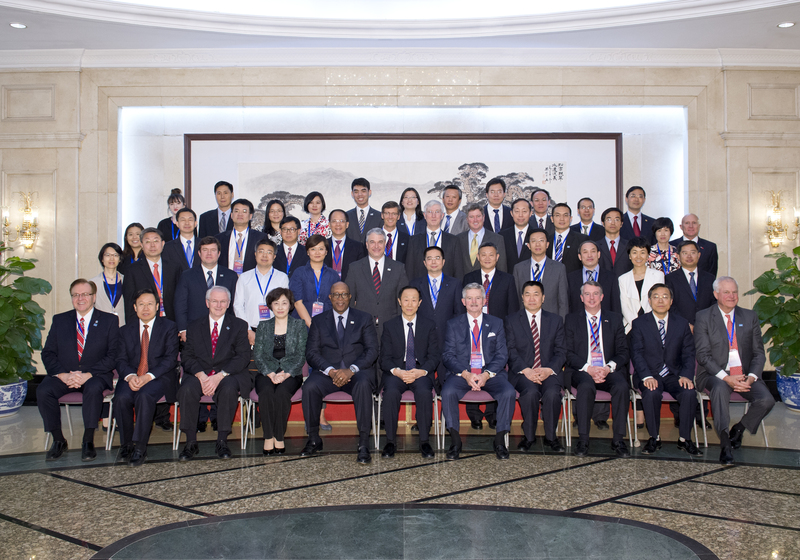 Group photo of all delegates and staff at the 8th U.S.-China High-Level Political Party Leaders Dialogue. 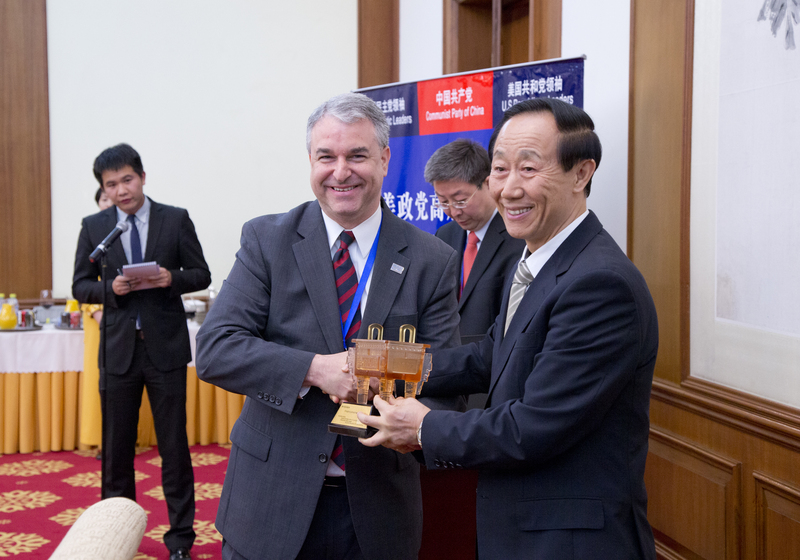 Vice Chairman Wang Jiarui presents the “Excellent Team Award of the U.S.-China High-Level Political Party Leaders Dialogue” to EWI’s China team, accepted by EWI Perot Fellow and Vice President David Firestein.